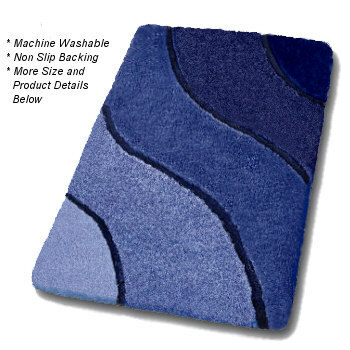 Sculpted wide wave design adds just the right dimension to this unique bathroom rug. Pile height 23mm / .91in rug. High quality, dense, very soft high pile . Grey: The range of greys include a soft oyster grey, flannel grey and medium tone greys. The lightest color is white. Marine Blue:Five blue tones range from a very dark blue to medium tone and light blue. Coordinated Lid Cover: Solid Marine blue. Ruby Red: Beautiful true red tones including a deep burgundy red, ruby red and bright red. Elongated lid cover for the Wave design is a solid color.